Village Fest is back for a third year! 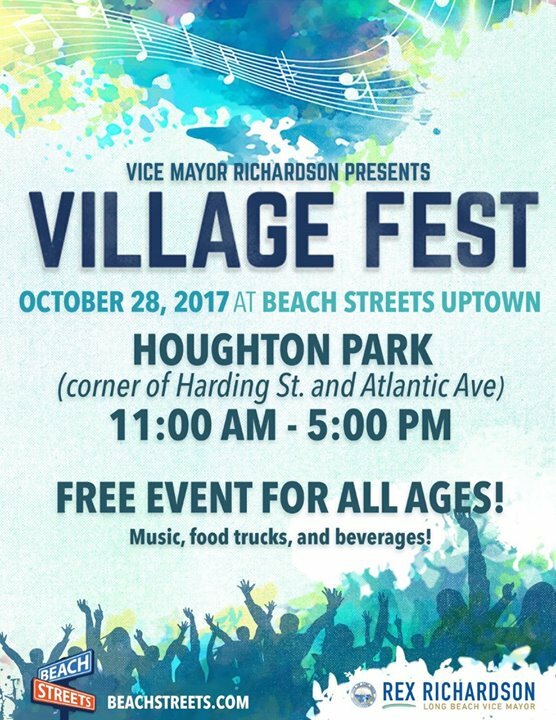 Village Fest at #BeachStreets is hosted by Vice Mayor Rex Richardson and will be rocking the corner of Harding and Atlantic on October 28th. · Pharcyde, with a live band- This will be Pharcydes’ third time playing Village Fest, and they are an audience favorite. Their first release in “Bizarre Ride II the Pharcyde” was two full decades ago, and its sense of timeliness is unmistakable. It shipped over a million units, garnered comparisons to De La Soul and Tribe Called Quest, and has been hailed as one of the greatest albums ever made. Today, the Pharcyde is still performing and touring the globe. · LAW- LAW is a rock band founded in Long Beach in 2013. The band consists of Jakob Nowell (Vocalist) son of the late Sublime lead vocalist, Bradley Nowell, Nick Aguilar (Drummer), Aidan Palacios (Guitarist), and Logun Spellacy (Bassist). They are currently writing new music and seeking to spread their message through straightforward, to-the-point, no-nonsense rock music. · Tiago Vega- An artist and songwriter, Tiago is currently working on his debut project RETROGRADE, which has five self-written songs. He has the sound of new R&B wave. · D.N.A.- D.N.A. is a North Long Beach based band made up of 4 teenagers, including three brothers Nathan (19), Daniel (14) and Angel Luna (13), and Jasmyne Jennings (16). All four members met approximately 3 years ago while taking music lessons locally. D.N.A. plays 70’s and 80’s funk music along with some current covers mixed in. This year’s Village Fest will also include Beat Swap Meet, a record swap meet featuring dozens of invited record collectors and dealers from all over the USA and beyond. It is the world’s most unique record show featuring music from all genres, all on vinyl, and everything inspired from it. Beat Swap Meet brings together families, music enthusiasts, dance lovers and everyone in between.